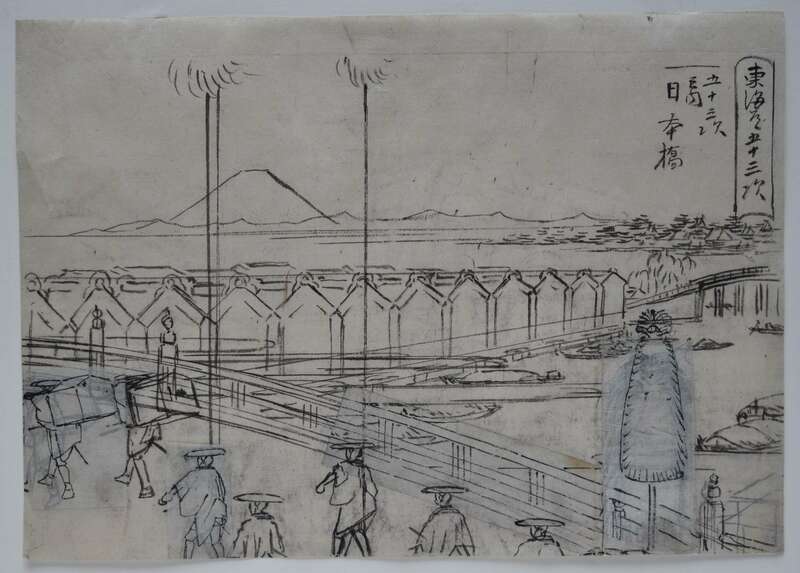 An important original drawing by Hiroshige being an hanshita-e (preparatory sketch) for an unpublished series Toto meisho gojusan tsugi, “Fifty-Three Views of Edo.” Shows Nihonbashi with a daimyo’s cortege crossing. 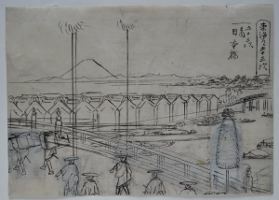 Warehouses in the background and a distant Fuji. Probably executed c. early 1850s. Sumi on thin paper, 9.5 x 13.5 in; 24 x 34 cms. Extensive pentimenti. Sold “as is” with imperfections but in good condition. Provenance: Ex Huguette Beres collection, sold Sothebys, Paris, 27/11/2002, lot 177.